Here at Crystal Herbs we can offer you one of the most comprehensive selections of different Flower, Gem and Crystal Essences around. Each of our Essences are handmade with love and care and are the product of our nearly 30 years of experience & research in the field of vibrational essences. Together our range of difference essences form a wonderful resource for anyone working with change, transformation and personal and spiritual growth. Flower, Gem & Crystal Essences help you to gently feel and release the old layers of buried emotions and thought patterns that unconsciously create who you are and how you react to situations & people in your life. 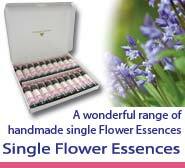 From the gentle acting 38 Bach Flower Remedies through to powerful, deep-acting Flower, Gem & Crystal Essences and combinations, we have a wonderful range of Essences to discover and explore. Each range has its own particular focus and purpose, so see which one or ones you feel most drawn to. If you're not sure where to start, often the Bach Flower Remedies and the Divine Harmony Essences are a good place to start. You can find out more below! 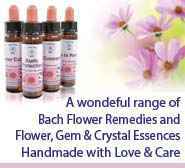 Bach Flower Remedies are a wonderful resource that can help everyone to achieve greater balance and harmony in their lives in a simple, natural & effective way. 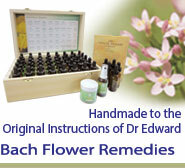 Our Bach Flower Remedies are made by hand with love & care according to the original instructions of Dr Bach. Preserved in organic brandy. Key Points - Simple and effective remedies that can quickly help to bring greater balance to the way you respond to everyday life. The Karmic Essences are a powerful set of essences that can help to open the inner doorways and take you straight to the heart of an issue, promoting a swift release of any unconscious belief pattern that is holding you back. Simple and easy to use they link directly into the seven personality groups identified by Dr. Edward Bach. Key Points - A powerful set of ten essences promoting a swift release of any unconscious belief pattern that is holding you back. This powerful set of Flower, Gem & Crystal Essences provides the tools that can help us restore the balance between mind, emotions & spirit that will allow us to manifest our own highest potential. 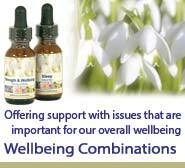 Each combination contains a carefully selected blend of essences and facilitates inner change & transformation that is gentle, effective and life enhancing. Key Points - Forty powerful Flower, Gem & Crystal Essence combinations designed to support your inner journey towards greater wholeness and self-awareness, activating and aligning you with your own highest potential. 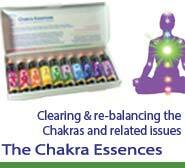 This powerful set of combinations offers you the opportunity to work at a deep level with the issues and patterns of each of the chakras that most affect our mental and emotional wellbeing. There are ten combinations in the set; one for each of the seven main chakras as well as one for the feet chakras, higher heart chakra and the higher chakras above the head. 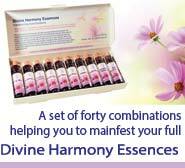 Key Points - A powerful set of ten essences to clear and re-balance the chakras and related mental & emotional patterns. 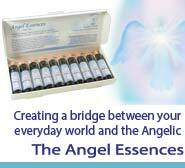 Each of the essences in this set of twenty Angel Essences creates a bridge between your everyday world and that of the Angelic Realms, linking you into their web of light and higher consciousness. The Angels will work with you through their essence to help you bring the positive qualities that they embody deeper into your awareness, bringing transformation and higher awareness. 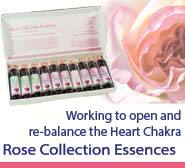 The Rose Essences and Rose Combinations in this set have each been chosen for their ability to help you to release all that is not love within your heart chakra and to inspire you to live your life from the perspective of the heart chakra. The consciousness of the heart is one of balance and unity and brings the gifts of inner peace, serenity, connection and unconditional love. 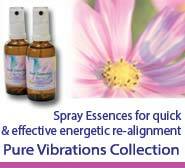 Our new Pure Vibrations Essence Sprays are designed specifically to provide the instant energetic support that can help you maintain positive vibrational alignment no matter what challenges you face in life. Essences sprayed into the auric field act very quickly and are especially helpful at those times when you feel temporarily out of balance or off centre. Spray liberally into the auric field for a quick and effective energetic realignment or use over a period of time to support more permanent transformation. You can also take these essence sprays internally in the same way as our other essence combinations if you wish. Key Points - Essence Sprays for positive vibrational alignment. The five deep acting essence combinations in this group each offer support with issues that are important for our overall energetic wellbeing and which can affect the quality of life we experience. Key Points - Five powerful and useful Flower, Gem & Crystal Essence combinations. 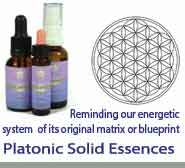 The unique Platonic Solid & Sacred Geometry Essences are powerful reminders to our energetic system of their original matrix or blueprint. Working at a subtle level these Essences help to encourage restoration of order and balance within our energetic blueprint. Key Points - There are five Platonic Solid Essences, three Sacred Geometry Essences and two combination Essences. Working with the inner child helps us develop a more positive personality, balanced emotions and greater spiritual connection, as well as creating powerful soul growth. 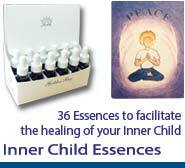 These 36 beautiful flower & gem essence combinations facilitate the healing of your Inner Child and help you return to the radiance of your pure, true self. Key Points - 36 essence combinations designed to help you connect with and heal your Inner Child, releasing the past to create a new future. 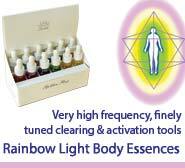 The Rainbow Light Body Essences are very high frequency, finely tuned clearing and activation tools, designed to assist in the development of our Light Body or Mer Ka Ba. This set of twelve very powerful essences provide exactly the support we need now, as we seek to assimilate higher & higher frequencies of Light into our energetic systems. Key Points - Very high frequency, finely tuned clearing and activation tools. 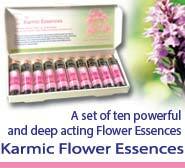 Flower Essences are a great tool to help you with your personal & spiritual growth. Each Flower holds a certain vibrational frequency or energy, which when taken, begins a process of helping to restore balance and harmony to mind and emotions. 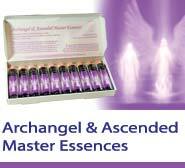 Gem and Crystal Essences are a great tool to help you with your personal & spiritual growth. Each Gem or Crystal holds a certain vibrational frequency or energy, which when taken, begins a process of helping to restore balance and harmony to mind and emotions. 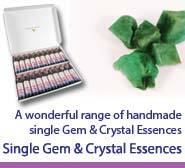 Key Points - A wonderful range of single Gem & Crystal Essences, handmade with love and care.